You are here: Home / Expired / Dallas #LEGOKidsFest Ticket Giveaway! 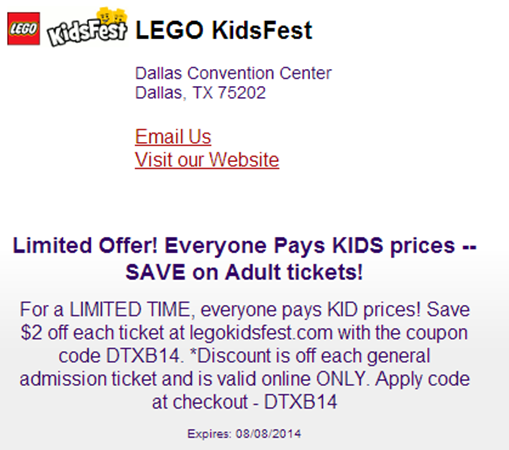 Dallas LEGO KidsFest Ticket Giveaway! Havre you ever been to LEGO KidsFest? I have not but, it sounds like a lot of fun! Limited OFFER! Everyone pays Kids prices! For a limited time, my followers can save $2 off each adult ticket purchased prior to August 8. These events have been selling out in past cities! Dallas Convention Center, August 29 – 31, 2014 LEGO KidsFest brings all of the creative hands-on, minds-on fun of LEGO building and experiences together in one activity- and entertainment-packed family event for children of all ages and builders of all skills and interests. The award-winning LEGO KidsFest returns to Texas – this time at the Dallas Convention Center — from August 29-31, 2014. Those who attended the previous show can once again expect hands-on building, creative experiences and one-of-a-kind activities. Children of all ages and builders of all skills and levels are welcome. The show only makes seven North American appearances each year. 1 Lucky Winner will receive 2 tickets to opening night! Mandatory entry: Just leave a comment telling why you’d like to go! This giveaway will end Saturday, Aug 2nd, 2014 at 11:59 pm Central time and the winner will be emailed soon thereafter. Make sure you add [email protected] to your address book, so you get the email if you win! I would LOVE to take my kids to this event. Their dream is to go to Lego land, they are 11 and 7, they both love Legos because their dad used to spend hours with them building cities. It’s a memory they’re very fond of since he tragically passed away in a car accident September 24th 2012. I cannot afford to take them to California but Dallas is a lot closer! I’d love to watch as my kid bask in Lego bliss, yet avoid the pain you get from the Lego blisters you get when you accidently step on one that’s left lying around the house. LOL! I subscribed to Dian’s Daily Deals.